Due to the rapid development of IoT technologies, widespread of SNS, and increasingly better resolution of digital images, a staggering amount of data is being generated around the world. And the rising need for long-term storage of big data is becoming a social issue. 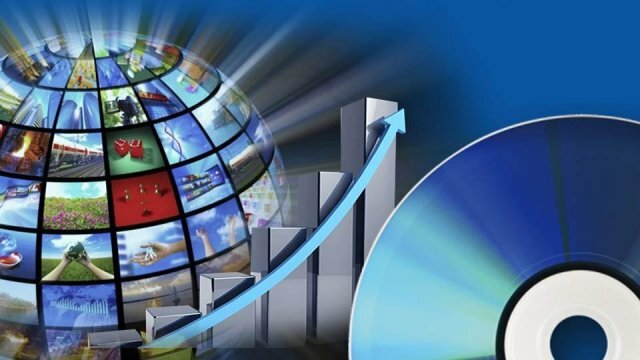 Amid such challenges, optical discs are drawing much attention in the IT industry as a media possible of safely and securely storing large volumes of data over an extended period of time. To meet the needs of today's society, Panasonic has been developing its optical archive business, drawing on the optical disc technology first developed in Japan that Panasonic has helped cultivate for more than 3 decades. The amount of digital data being generated by the evolution of the Internet, the onset of IoT, and better resolution of digital images all around the world is expanding exponentially. 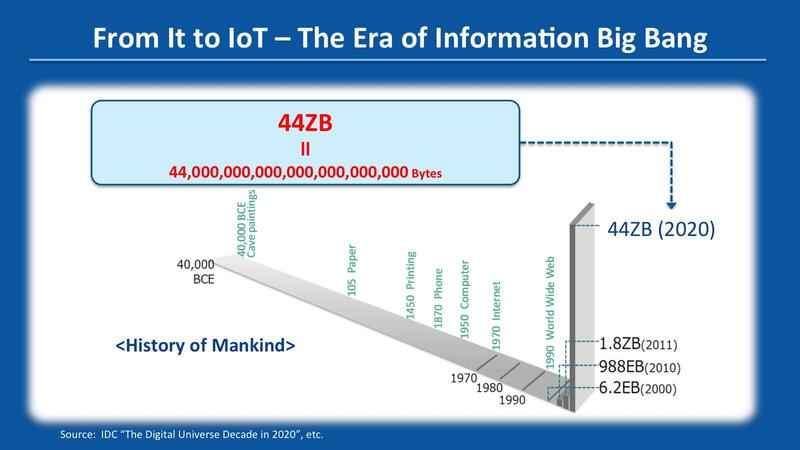 It is estimated that the volume of data will reach 44ZB (zettabytes) in just 20 years after entering the 21st century. And each year, 4.5ZB of new data may be generated. Of which approximately 3.5~4% is archive data, or needs to be stored long-term. Panasonic estimates that the annual value of this market is approximately 1 trillion yen (calculated at 5 cents per GB). If we look at what is happening over a long span of time since the birth of mankind, it becomes clear that the amount of data generated around the world has grown exponentially in the 21st century. 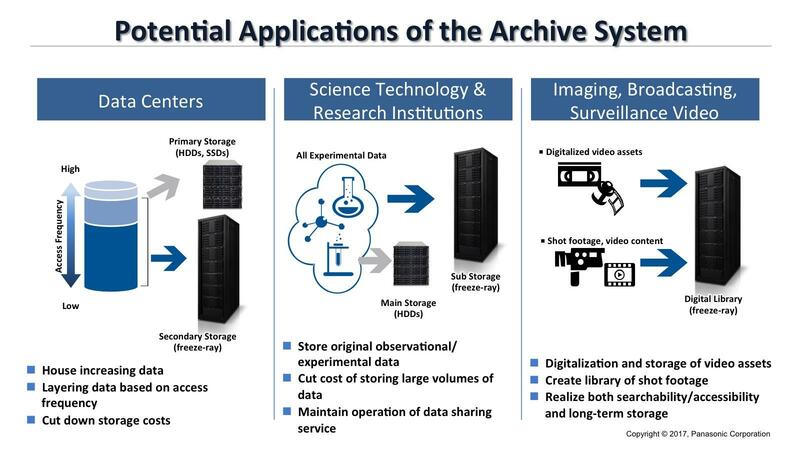 Cultural and artistic data that are humanity's legacy, security essential for safe living, medical data, big data used to develop AI, and data that helps create new value using cutting-edge technologies such as deep learning need to be stored as archive data. 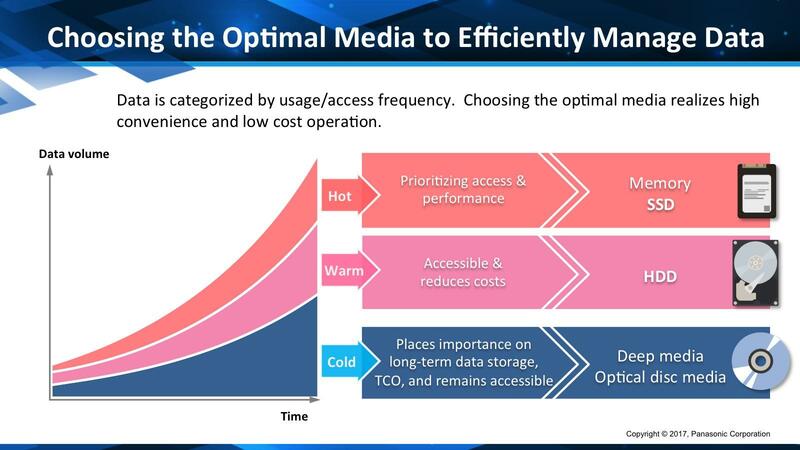 Digital data may be classified into 3 categories - hot data, warm data, and cold data - depending on how often it is used or accessed, and it should be housed on media that is best suited for the specific storage criteria. Cold data, data that is not accessed so frequently but should be stored long-term, or in other words archive data is best stored on optical discs. 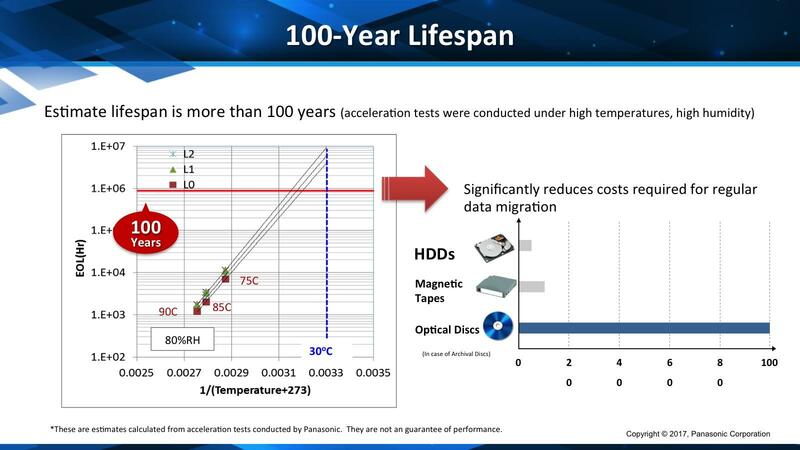 This is due to the unique attributes of optical discs, which are "permanence = tamperproof," "stability = lifespan of 100 years," and "low power consumption." Power consumed to store data is increasing, so reducing the power consumed by data storage has become a growing environmental concern. According to the Ministry of Economy, Trade and Industry's 2008 calculations, by 2025 IT devices will consume 5.2 times more power than in 2006. Worldwide this figure comes out to be 9.4 times and is equivalent to 15% of the total power generated globally. 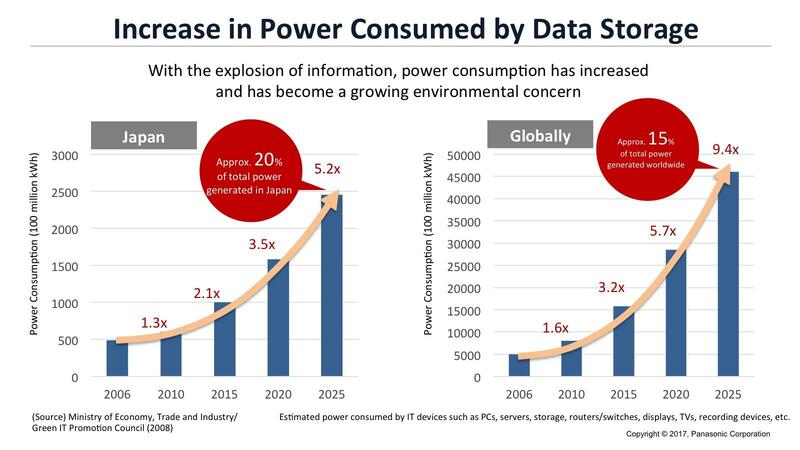 And majority of this power is and will be consumed by data centers to store accumulated data. 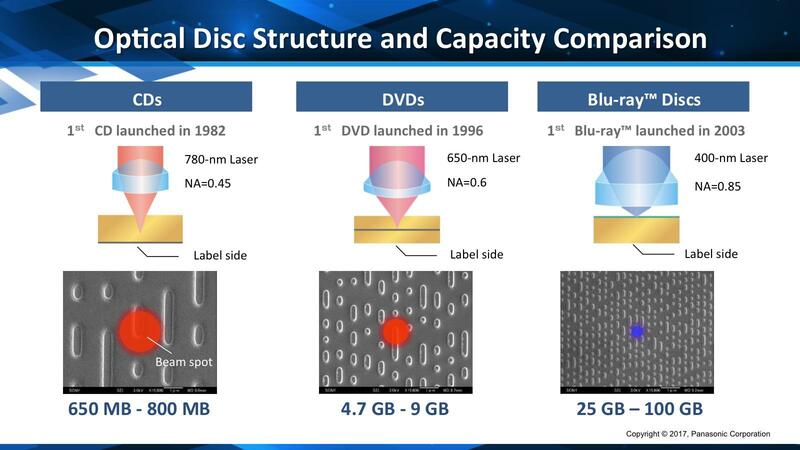 Drawing on its know-how and expertise in optical disc technology cultivated over the last 30 some years, Panasonic has continued to make headway in developing higher-density optical discs. 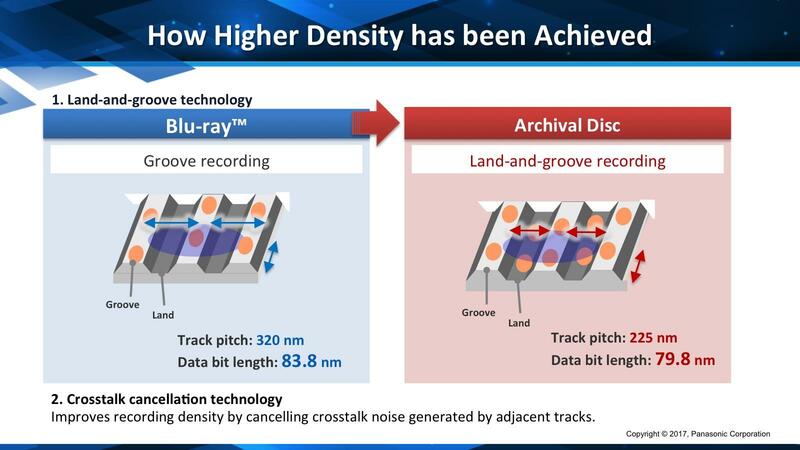 And together with Sony Corporation, Panasonic has co-developed the next generation optical disc, the "Archival Disc" optimal for storing large volumes of data over an extended period of time. Then in 2016, Panasonic began mass producing these Archival Discs. 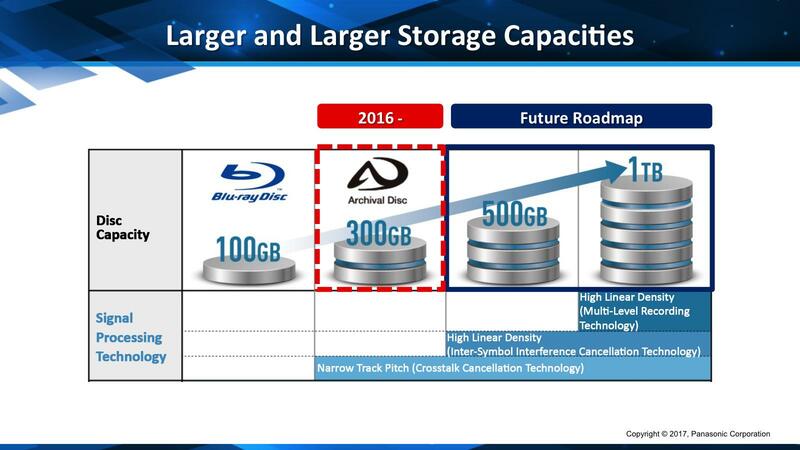 Panasonic has plans for increasing disc capacity from 500GB per disc to 1TB and for their mass production. Optical discs have great potential to further enhance their recording density (storage capacity) with technological advancements in, for example, signal processing technology. 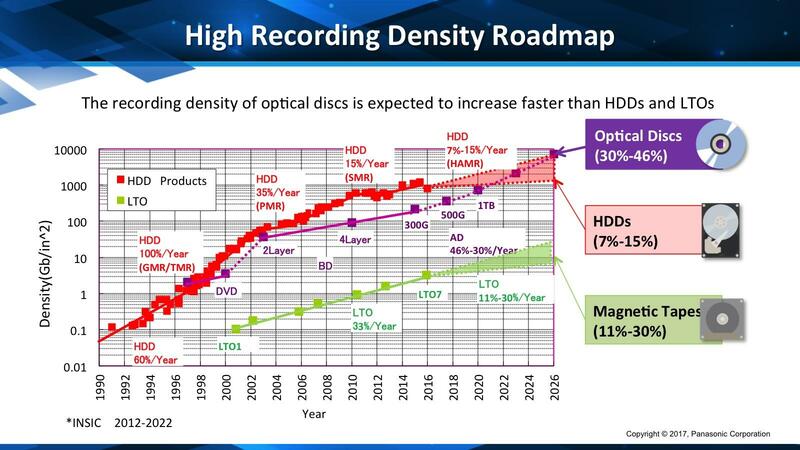 If we compare the growth in the recording density of HDDs, optical discs, and magnetic tapes, in 10 years, from 2016 to 2026, the recording density will improve by 7~15% for HDDs and 30~46% for optical discs. For magnetics tapes, the increase is estimated to be less than 30%. To estimate the longevity of the media, industry standard acceleration tests were conducted. Error occurrence rates were measured in temperatures 30℃ and above and in less than 70% humidity. These tests estimate that Archive Discs can reliably store data for more than 100 years. On the other hand, hard disks have a lifespan of a few years, and magnetic tapes a dozen or so years. Because optical discs have a long life, unlike hard disks and magnetic tapes, there is no need to regularly migrate data from degraded media to new media. Moreover, optical discs do not require operations or cooling of facilities that are associated with hard disks, therefore, long-term storing of data on optical discs can reduce power consumed as well as costs incurred. 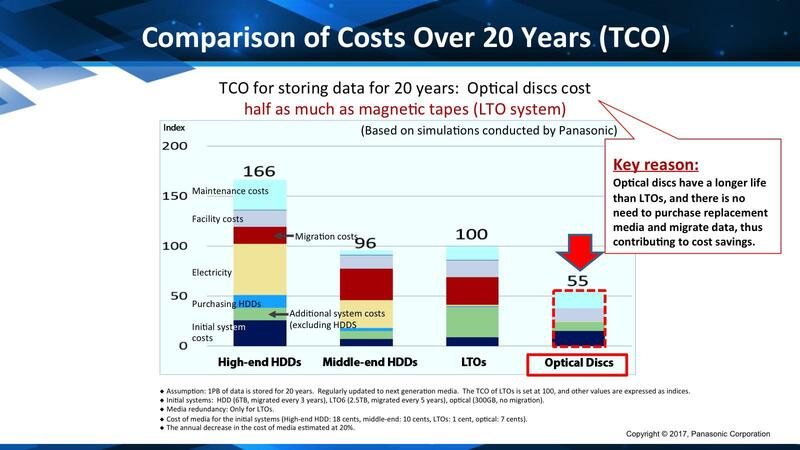 If 1PB (petabyte) of data are stored for 20 years on HDDs, magnetic tapes, and optical discs, with widely available HDDs and magnetic tapes, the costs come out to be around the same, whereas with optical discs, it is estimated that the data could be store at half the cost. With respect to the evolution of storage capacity of CDs, DVDs, and Blu-ray Discs, Panasonic has employed smaller sized pits/marks, shorter wavelength laser for data recording, and improved drawing rates. Furthermore, Panasonic has developed double-sided, triple-layer discs with a capacity of 200GB per disc (100GB on each side). 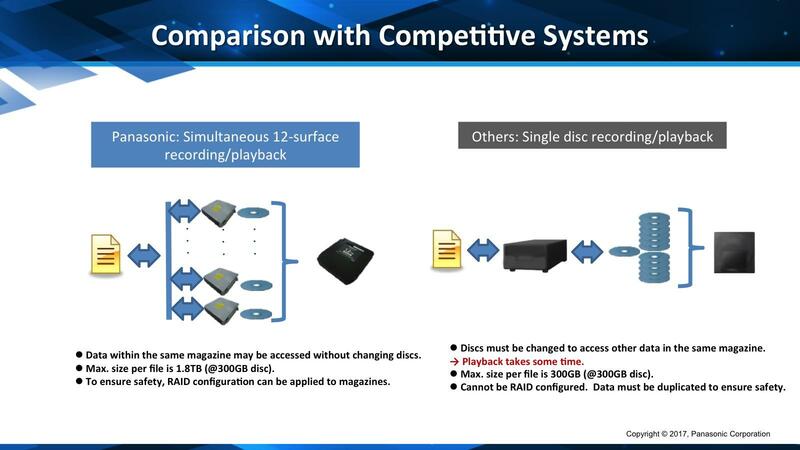 With Archival Discs, Panasonic adopted 2 new technologies to realize a capacity of 300GB per disc. Land areas between the grooves were traditionally unused, but the "land-and-groove technology" records data on land tracks as well. "Crosstalk-cancelling technology" cancels crosstalk noise generated by adjacent tracks ensuring playback quality without read error even with narrow track pitches. 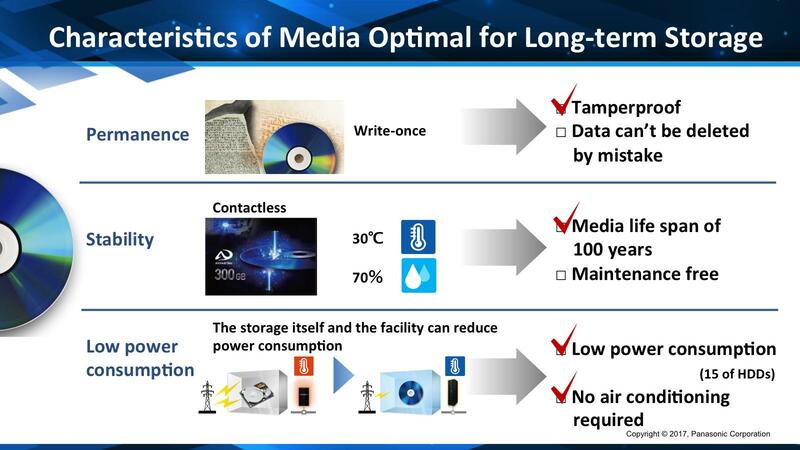 In the future, Panasonic will adopt technologies to enhance data recording linear density (multi-level recording technology) and to enable recording and playback that eliminates interference between adjacent data (inter-symbol interference elimination technology) to further improve disc capacity. Panasonic is taking advantage of the extensive range of elemental technologies it has developed over more than 3 decades, such as lens optic technology which creates and controls a fine laser and chemical technology that enhances disc materials, to develop a new Archival Disc. In March 2016, working with Facebook, Panasonic announced that it has developed the data archive system, "freeze-ray," which uses Archival Discs with a storage capacity of 300GB. 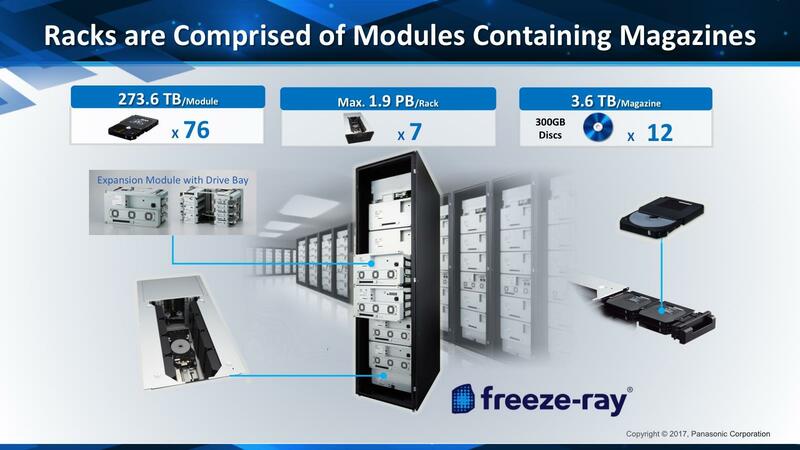 "freeze-ray" is a highly efficient, sustainable system optimal for cold data, in other words data that is seldom accessed, but needs to be stored long-term. "freeze-ray" stores data in magazines, which is comprised of twelve 300GB, double-sided, write-once, Archival Discs. 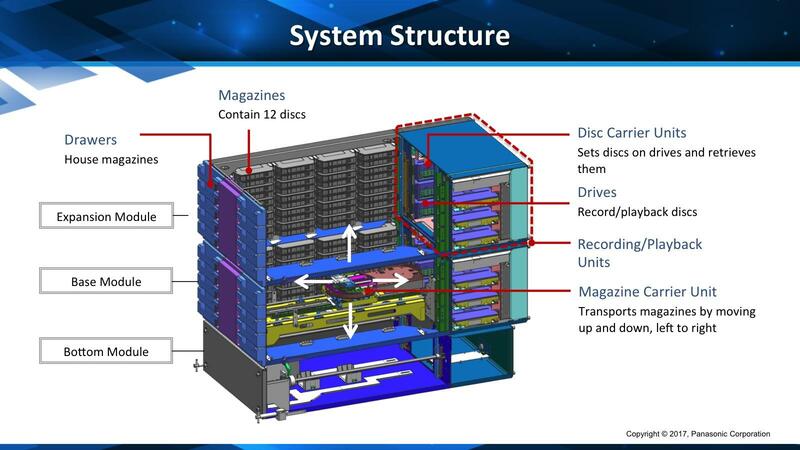 Each magazine can store 3.6TB of data, and one row of modules comprised of these magazines can store 273TB of data. A rack is standardly equipped with 7 rows of modules, bringing the total data capacity of the rack to 1.9PB. The "freeze-ray" system employs Panasonic's proprietary method that can retrieve 6 discs from a magazine and simultaneously record or playback data on 6 drives. In other words, 1 file data may be scattered and simultaneously recorded on 12 sides. And the data transfer speed is 360mbps. This is on par with hard disk data transfer speeds. In addition, each magazine is compatible with up to RAID 6 recording, ensuring data security. And the data within a magazine can be accessed without changing discs. This proprietary method was developed with data storage at data centers in mind from the beginning. Working with Facebook to develop this system, enabled Panasonic to receive and incorporate a lot of feedback. Panasonic highly values user feedback; it is the guiding star to Panasonic development and manufacturing. The archiver looks like a jukebox. The magazine carrier unit moves around within the device, retrieves the desired magazine and delivers it to the drive unit. 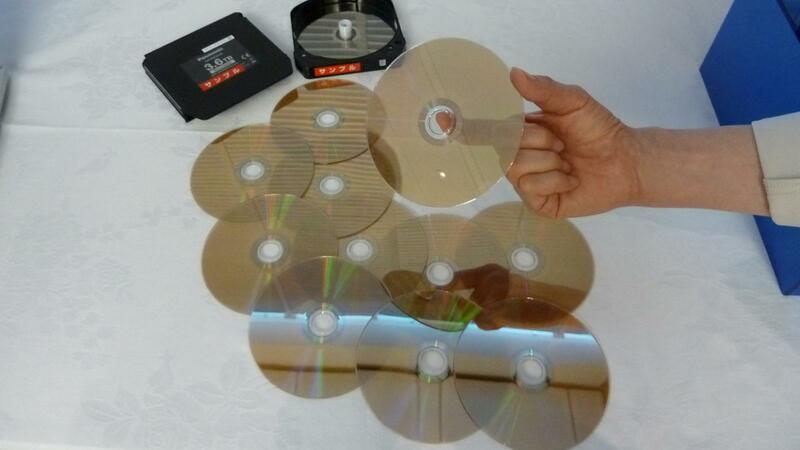 Six discs are then removed from the delivered magazine and data is simultaneously written and recorded onto these discs. Using its precision mechanics and technology, Panasonic has brought to life a highly reliable IT device and design that offers many features coveted onsite, such as measures against static electricity. "freeze-ray" is expected to be in demand in a wide range of fields, mainly in data centers where data will be archived long-term, as well as for social infrastructure, science and academics, or in broadcasting, security, etc. Panasonic is proactively collaborating with software and system developers, who specialize in these fields, to be able to also provide the software required in these fields and for special applications. 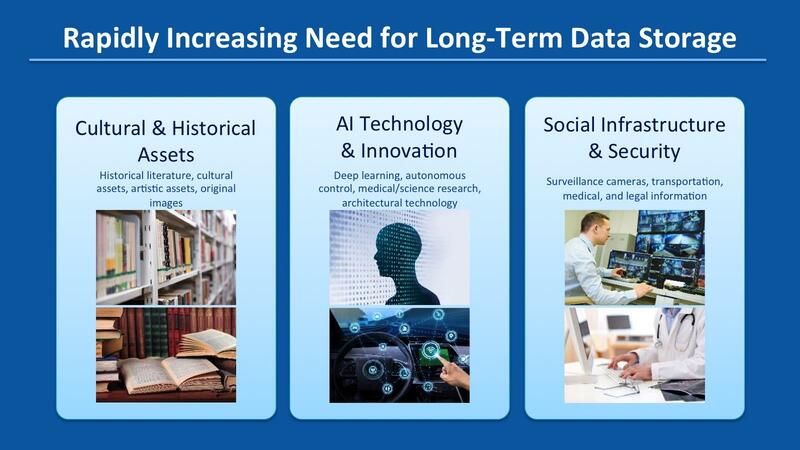 Panasonic has already received many requests from key companies and research institutions in various fields to store valuable data with absolute certainty for more than a century, for future societies, and has embarked on projects to meet these needs. For example, at the National Institute for Fusion Science located in Gifu Prefecture, the "freeze-ray" is in use to store large volumes of valuable data generated day and night in search for a new energy source. The system was adopted because of its attributes, namely high capacity, reliability, long life, and random access. Globally as well, the system has already been adopted by a major SNS operator in the U.S., and is about to be adopted by a data center project in China, which handles large volumes of data. Hopes represented by the "Rosetta Stone"
Panasonic aspires to and hopes to be of service to society by safely and securely storing huge volumes of diverse data for centuries to come. Because "freeze-ray" stores data long-term, the logo has been design to resemble the Rosetta Stone. 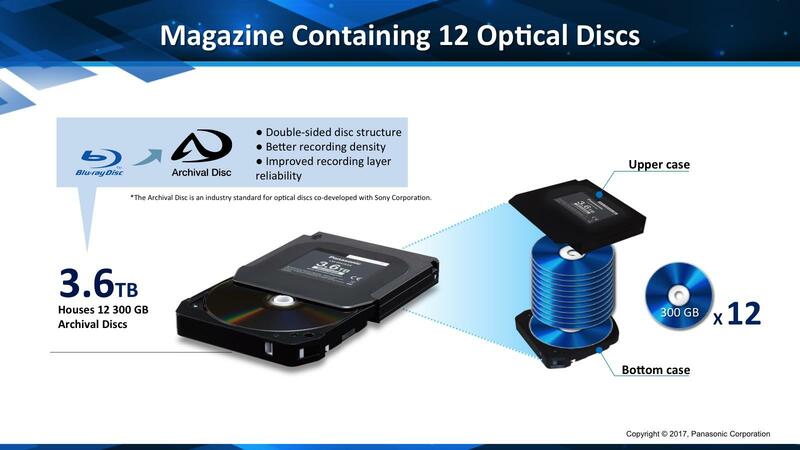 The optical disc archive business has only just begun, but Panasonic has a wealth of experience in optical discs including disc and device development it has cultivated for more than 30 years. Panasonic hopes to continue to help this business grow globally, so that it may become Japan's leading industry. There is ever-growing need to store large volumes of data over long periods of time. 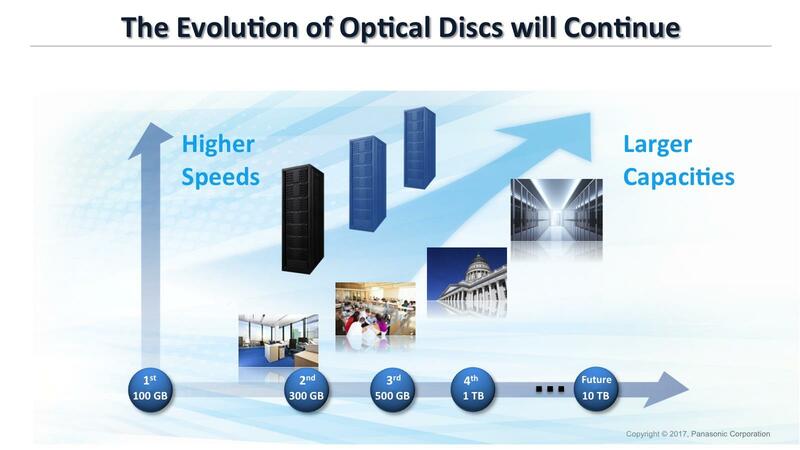 To meet such needs, Panasonic will continue to develop new generation optical discs.